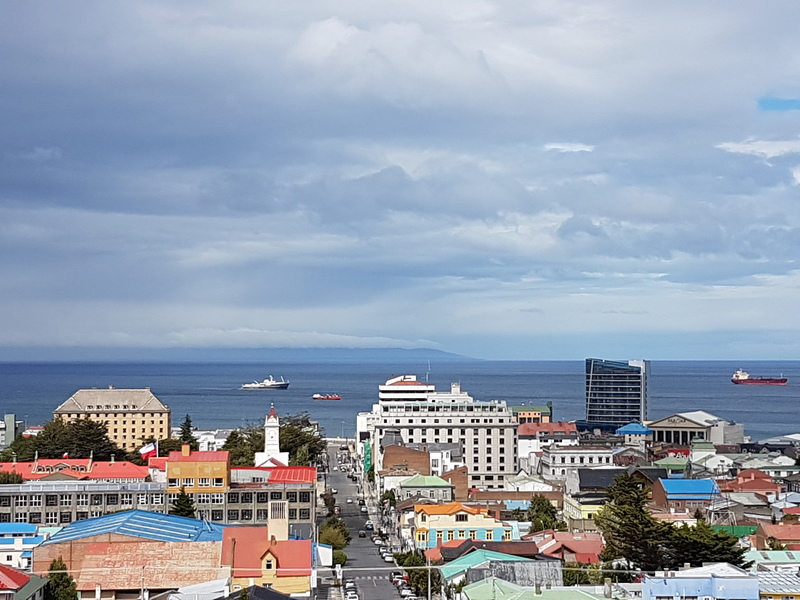 Punta Arenas and the Magellan Straits. 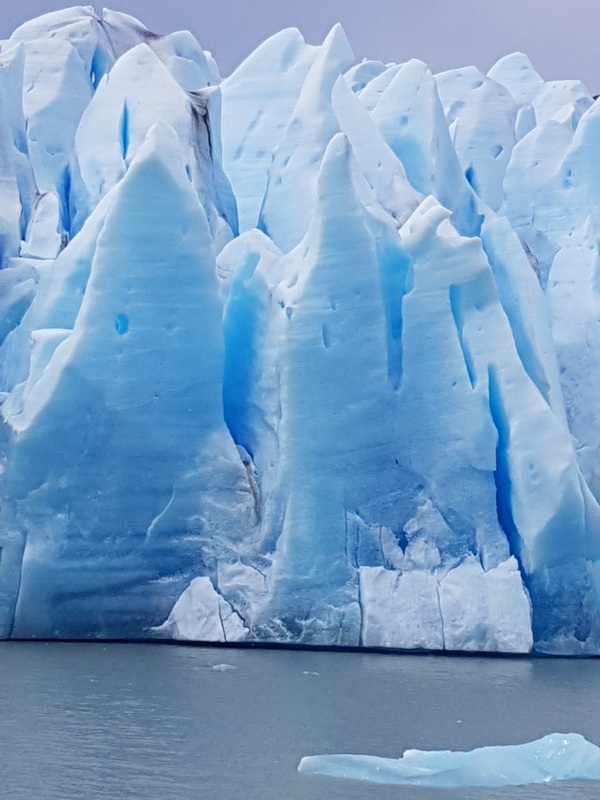 21st January 2018. 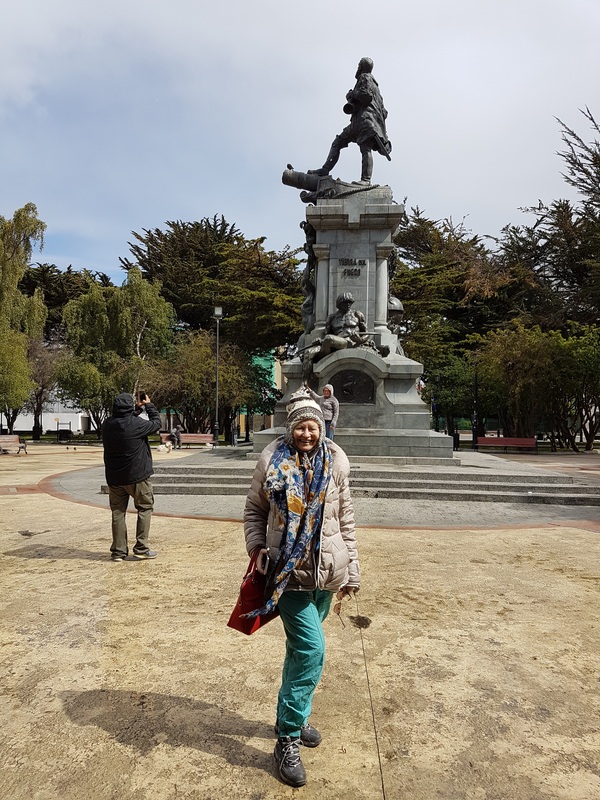 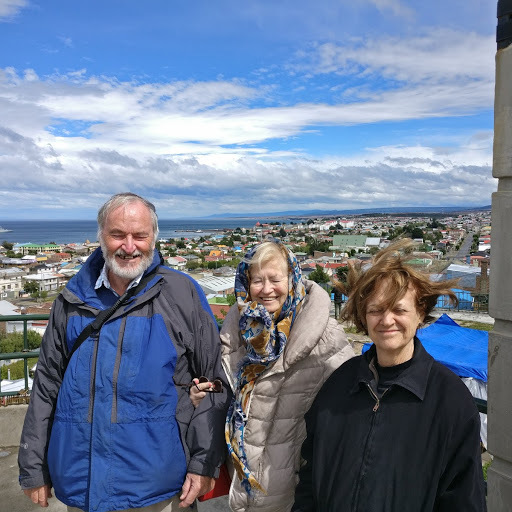 We took a 3 hour flight from Santiago to Punta Arenas and were picked up at the airport there by a representative of the travel company and given a tour of the town. 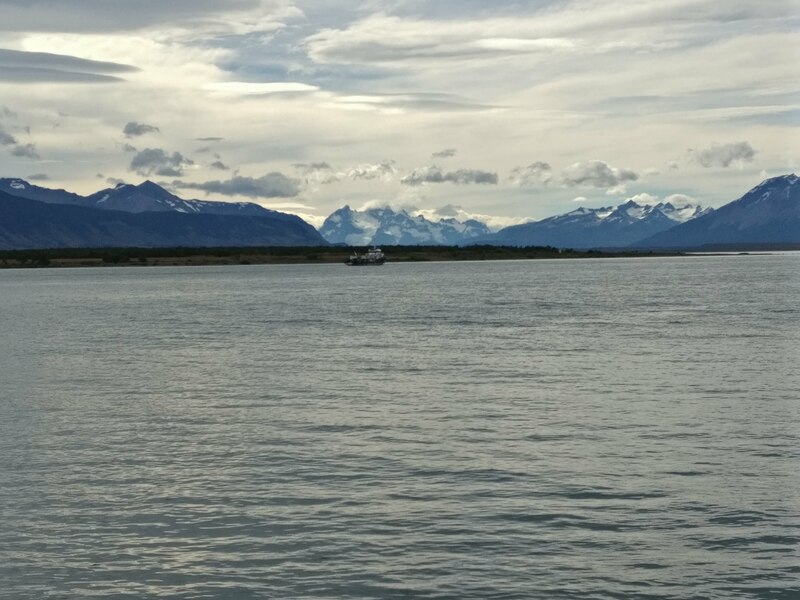 Beyond the Straits you can see Tierra del Fuego in the distance. 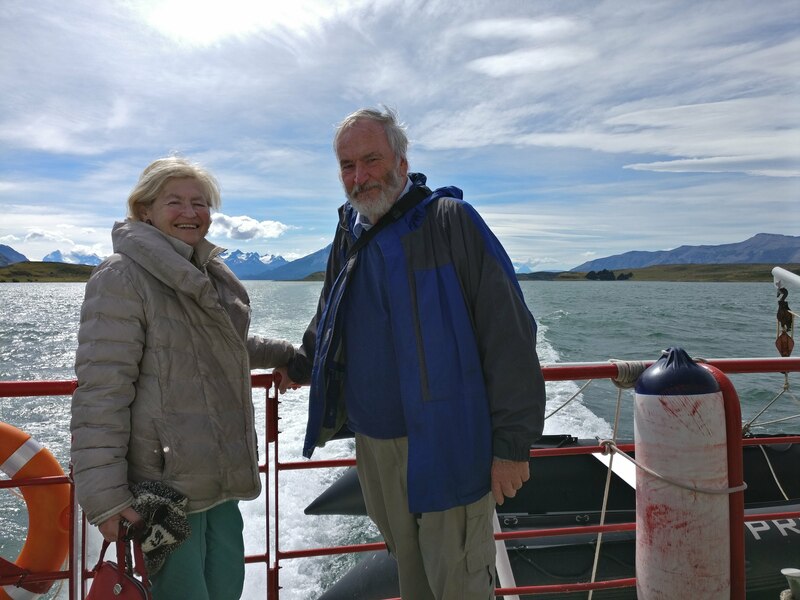 It's summer here so although breezy there were none of the fearsome seas that this coast is notorious for.. 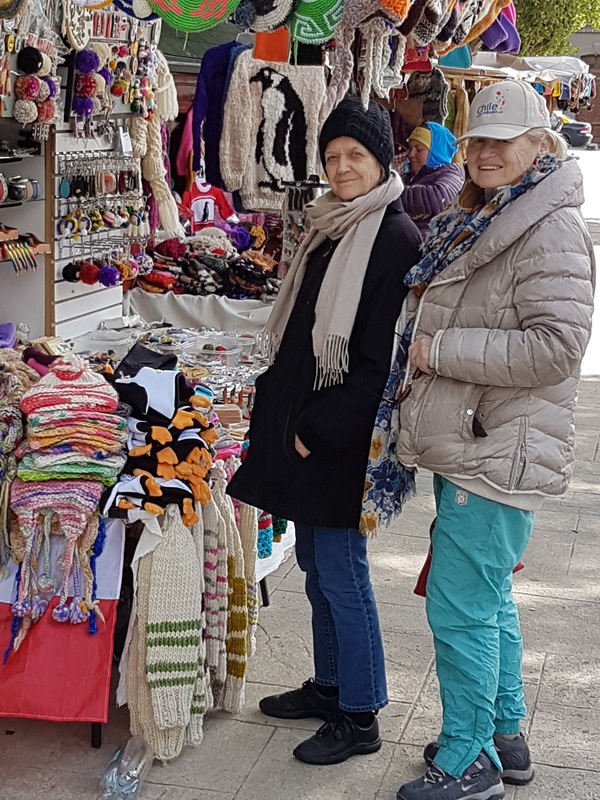 Here are Barbara and Stephany in Punta Arenas looking at a stall selling tourist items. 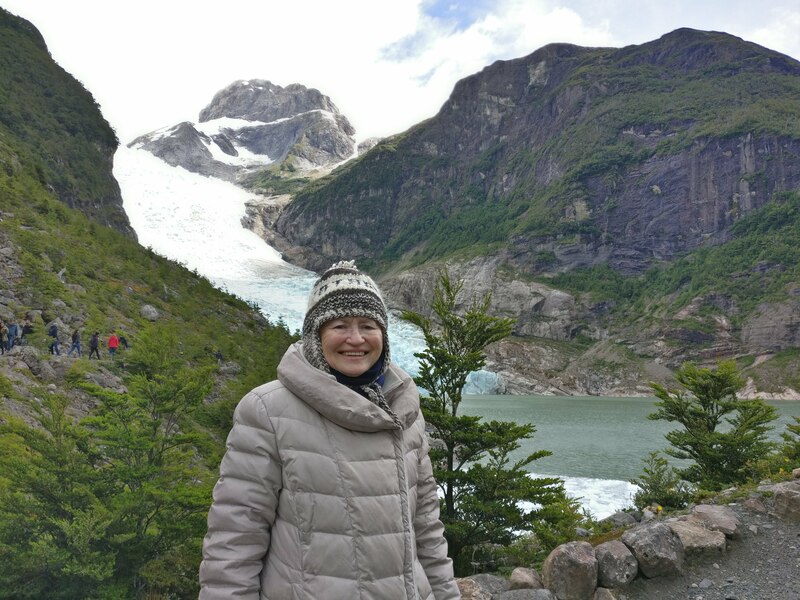 Stephany purchased a woollen hat here. 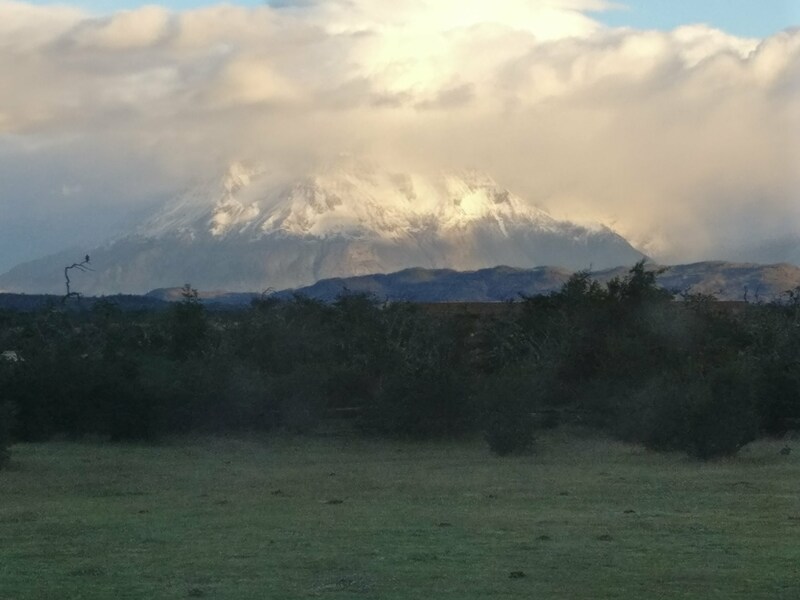 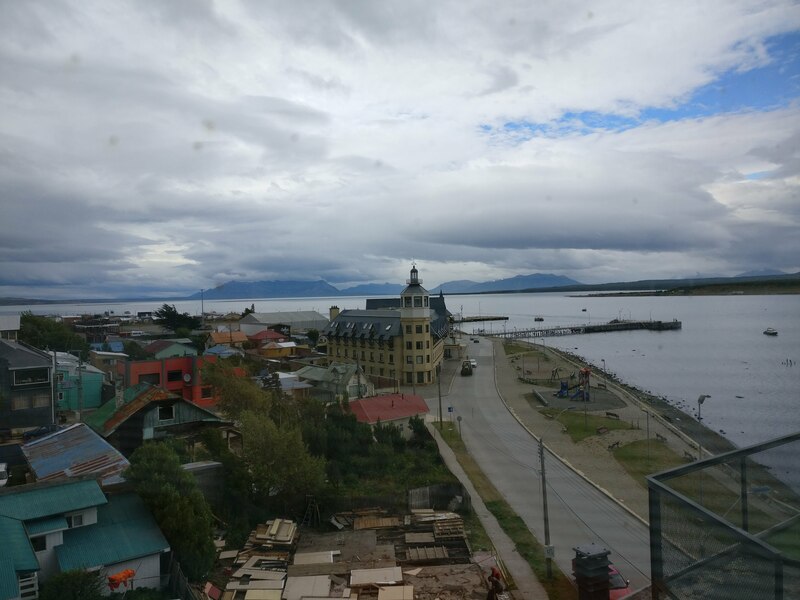 Punta Arenas to Punta Natales. 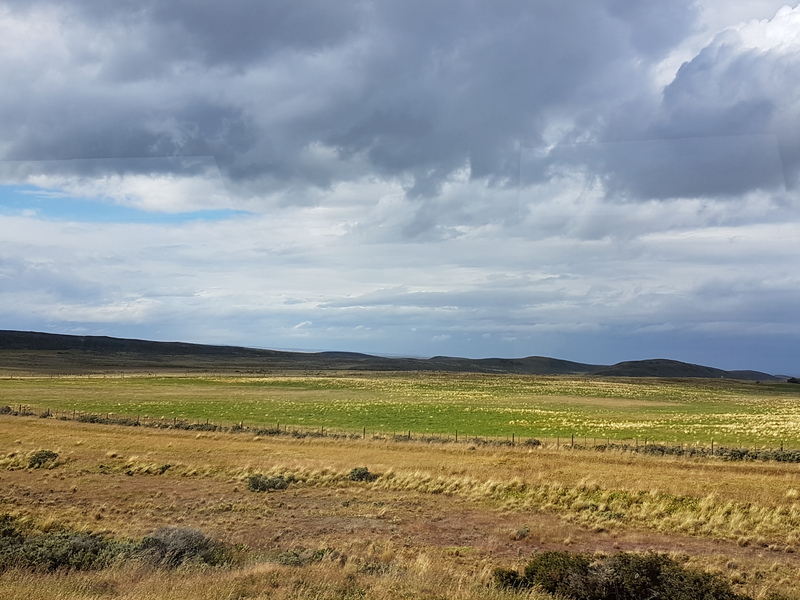 Leaving Punta Arenas late afternoon we took a bus to Puerto Natales - a journey of 3 hours through a pretty much barren landscape. 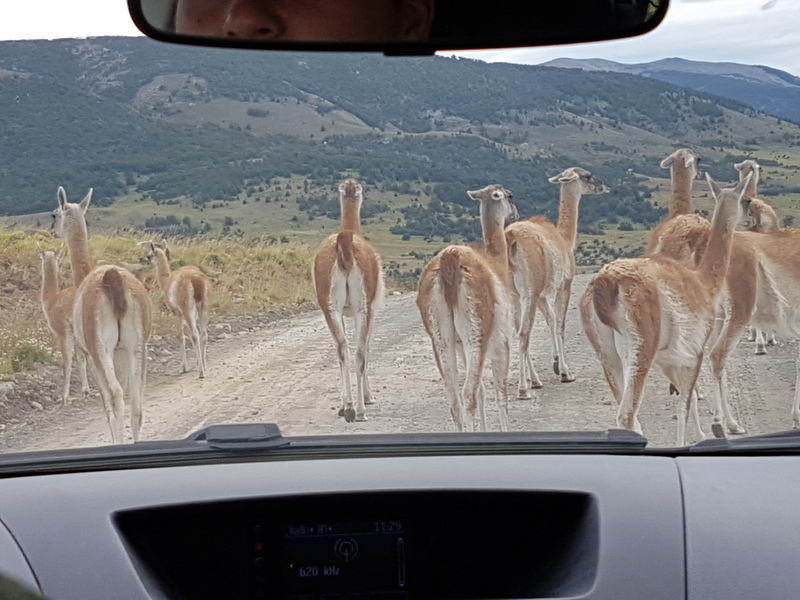 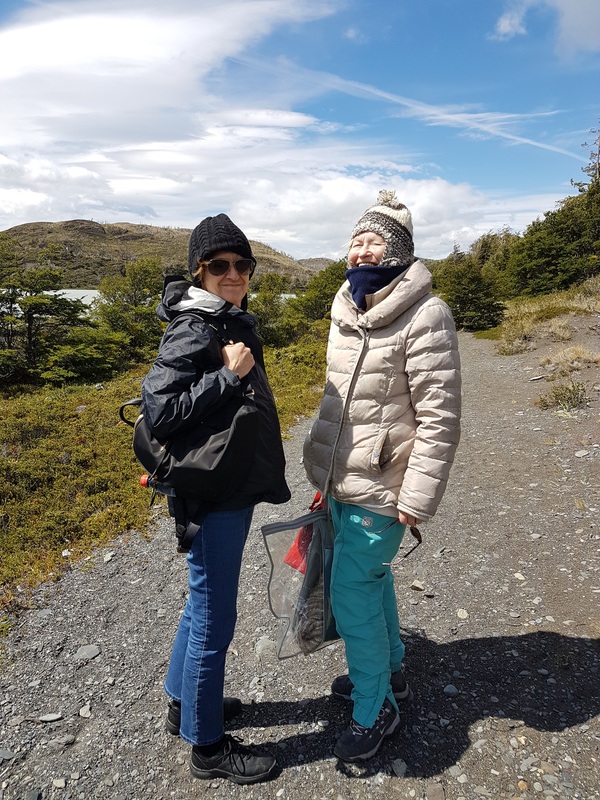 We saw a few sheep and one or two isolated farmsteads (estancias) and on one occasion a Patagonian Ostrich called Darwin's Rhea. 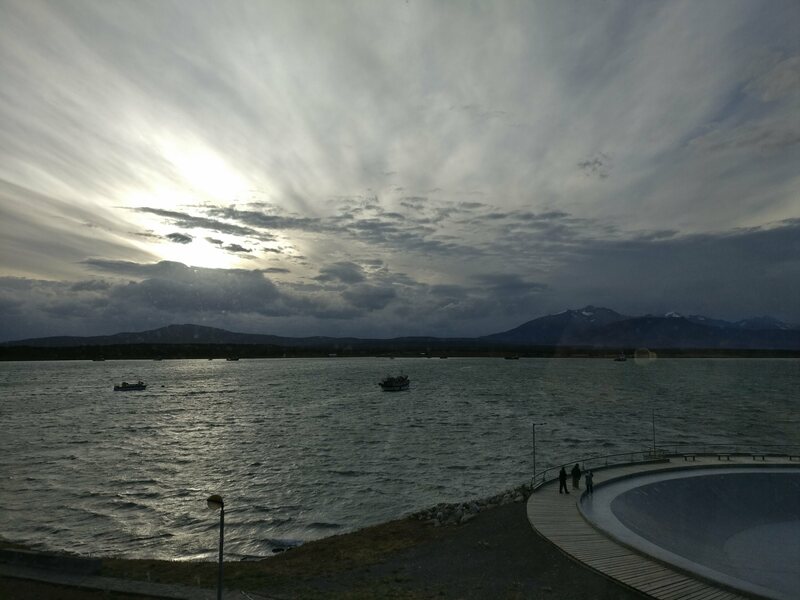 In Puerto Natales we stayed in a very warm and comfortable hotel called the Hotel Noi Indigo. 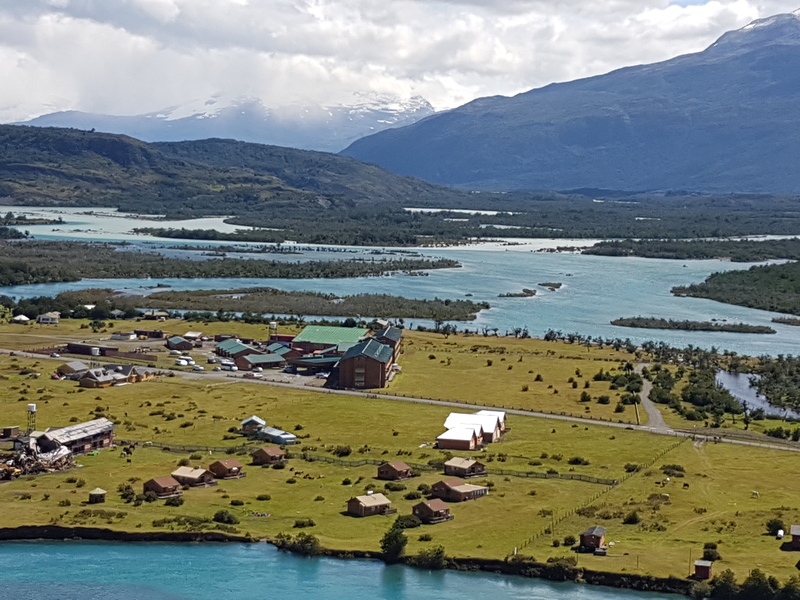 The hotel is situated on the fiordo de Ultima Esperanza and the views up the Fjord are not to be missed. 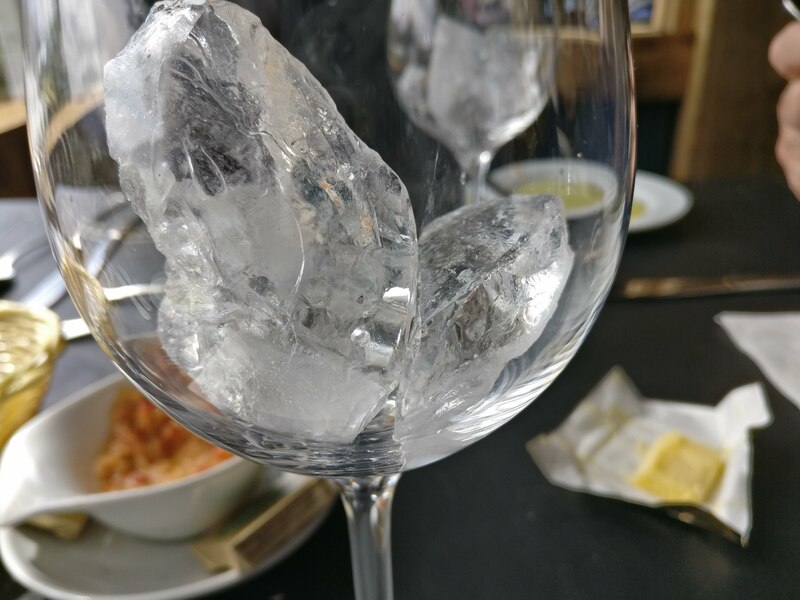 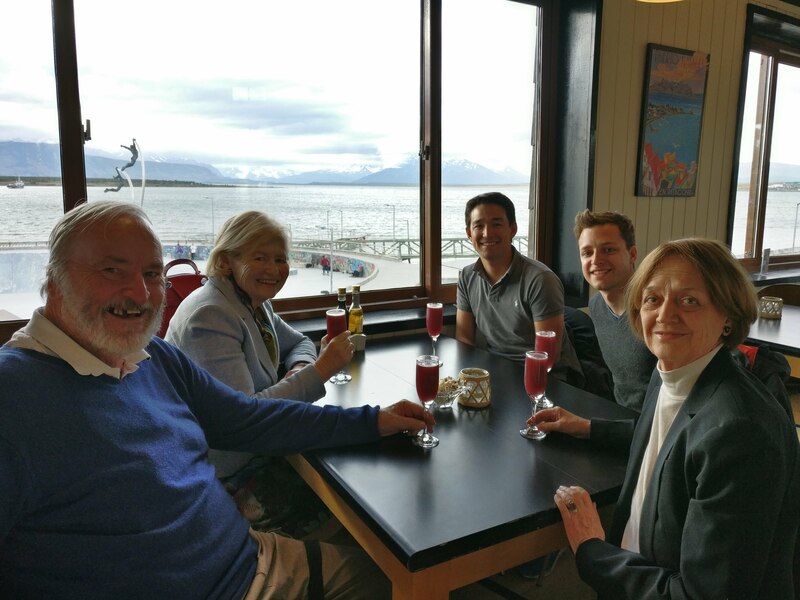 We were tired but we soon forgot the long journey as we drank the local speciality, Calafate Sour- a variant of Pisco Sour but with the red juice of Calafate berries added. 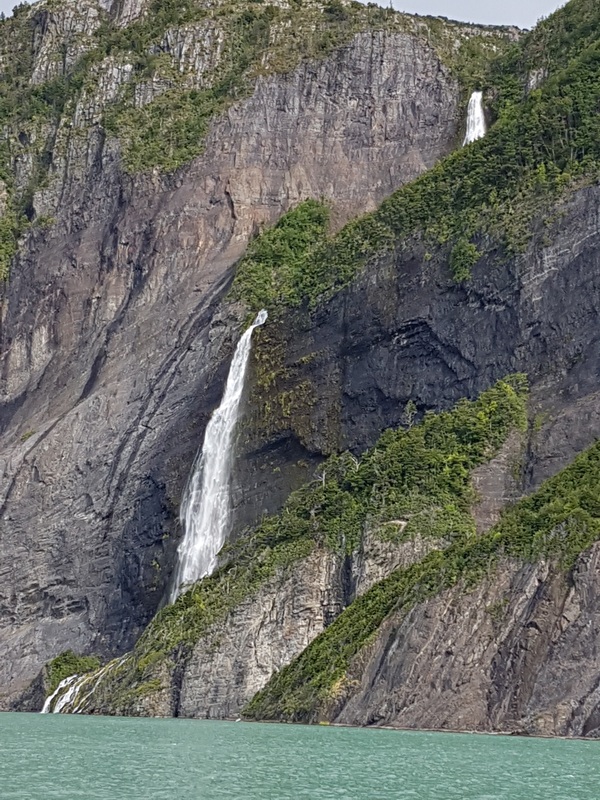 Salto Grande. 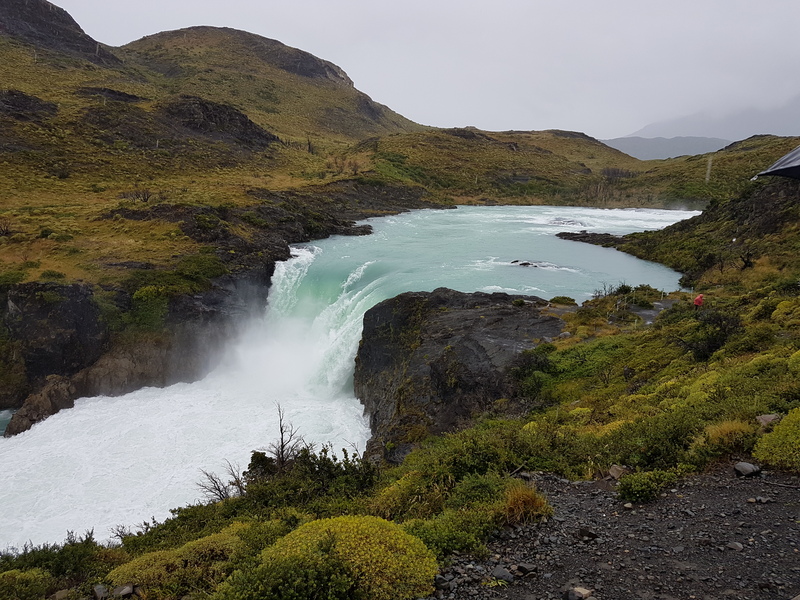 Having driven past Lago Nordenskjold in the rain we got out of the bus and walked 100 yards to the waterfall. 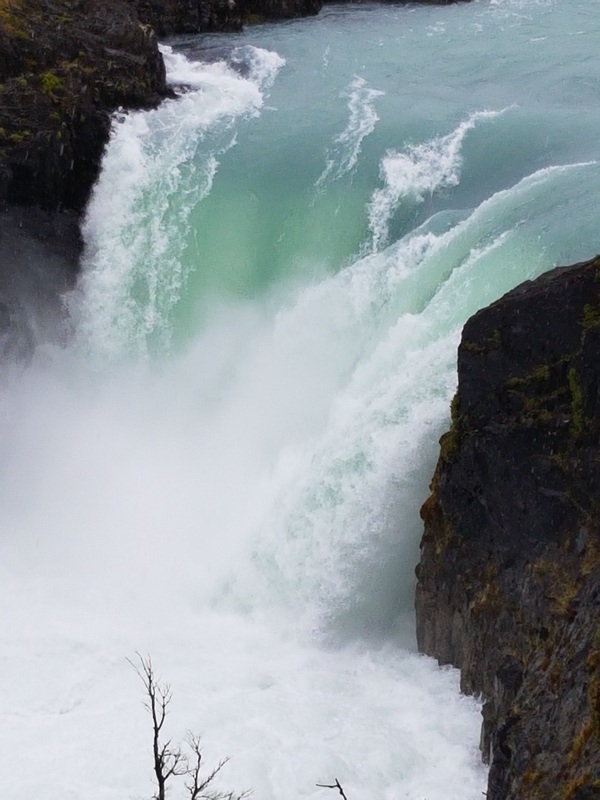 The water rushed down with some force before descending into the lake beneath. 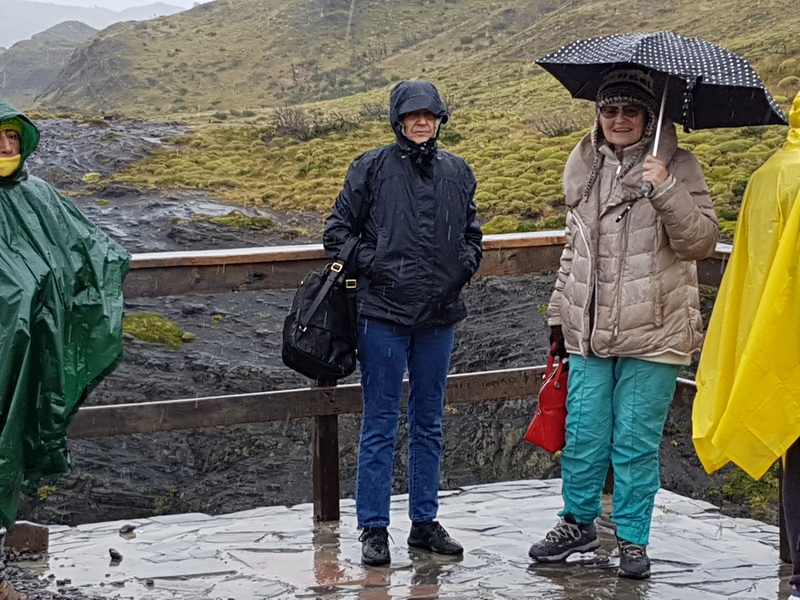 Here are two hardy tourists standing out in the rain beside the waterfall. 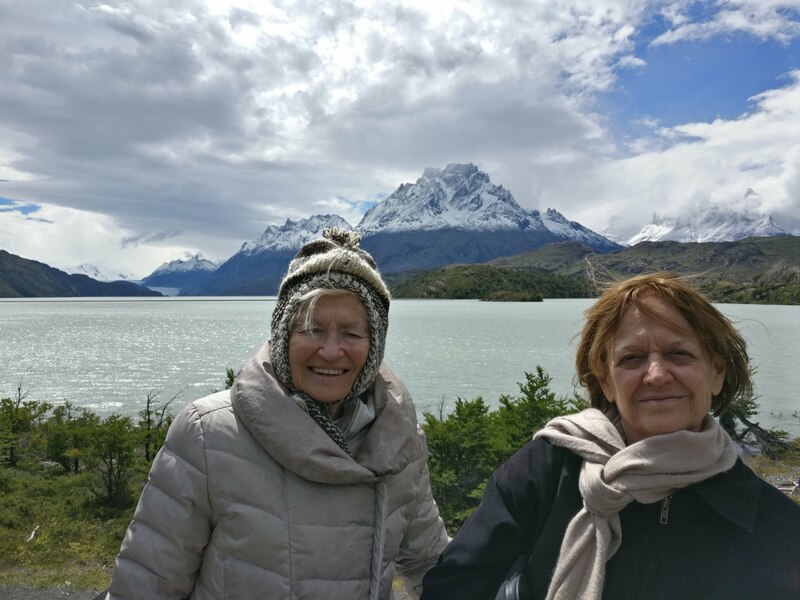 Shortly after this picture was taken they beetled back to the bus leaving the intrepid photographer to admire the scenery alone. 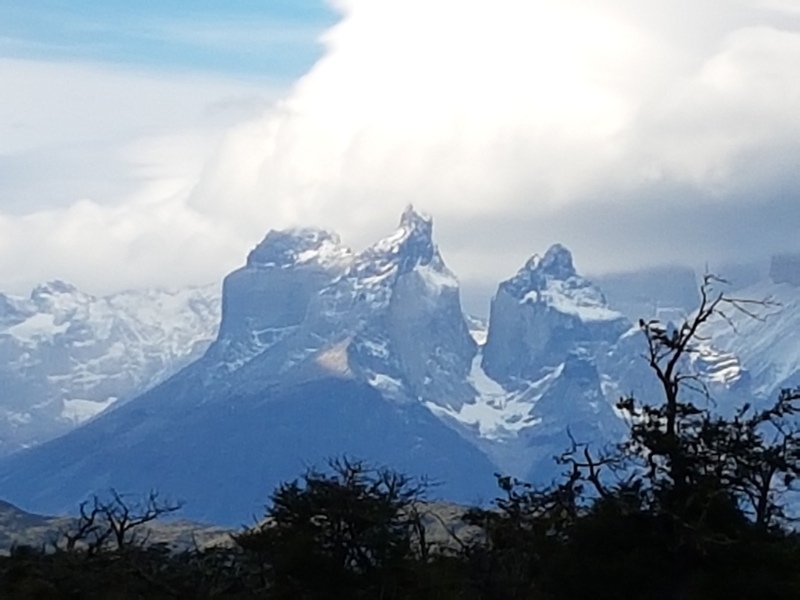 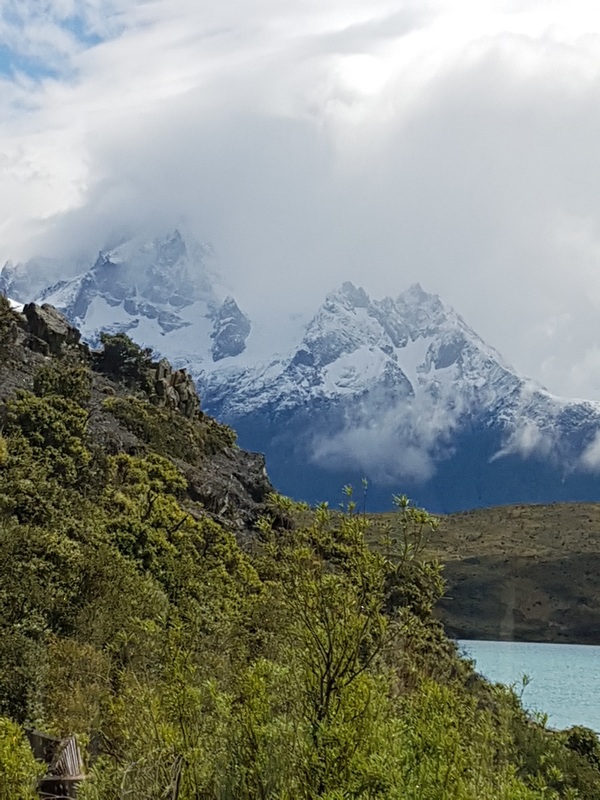 Just as the bus was about to depart the guide went around the bus showing a picture of the Torres del Paine and explaining that if we hadn't had the rain and mist we would have seen the towers from this vantage point. 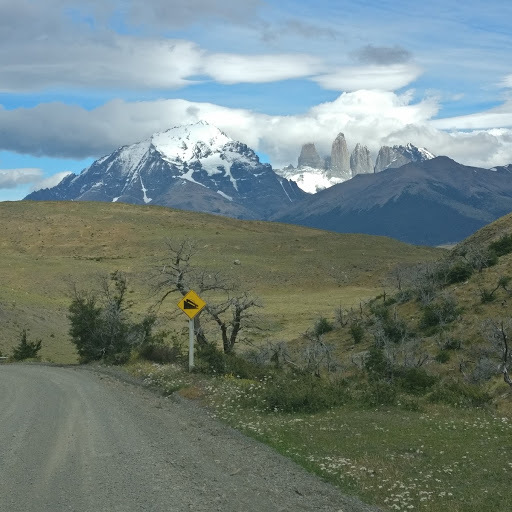 Our hearts sank at the prospect that we might not see what we came all this way for. 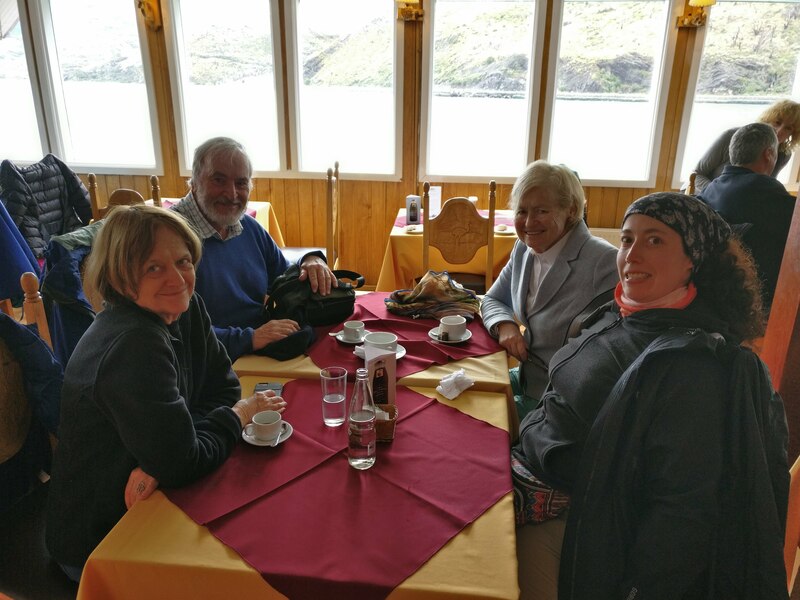 Completely sodden from the rain we were taken on to Lago Pehoé where the bus stopped so that we could have lunch at the hosteria located on a small island in the lake.. 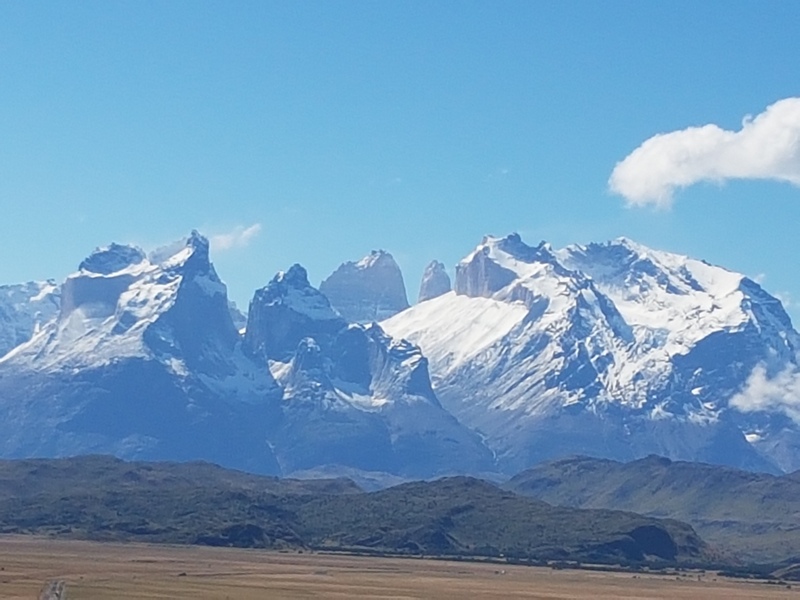 The views from the hosteria were just stunning. 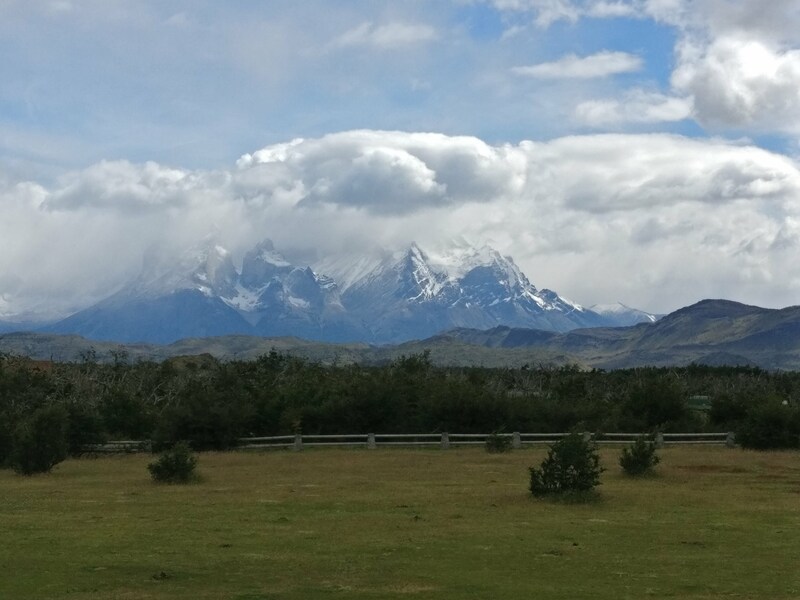 And so on to our second hotel located just 5 minutes drive from the entrance to the Torres del Paine National Park. 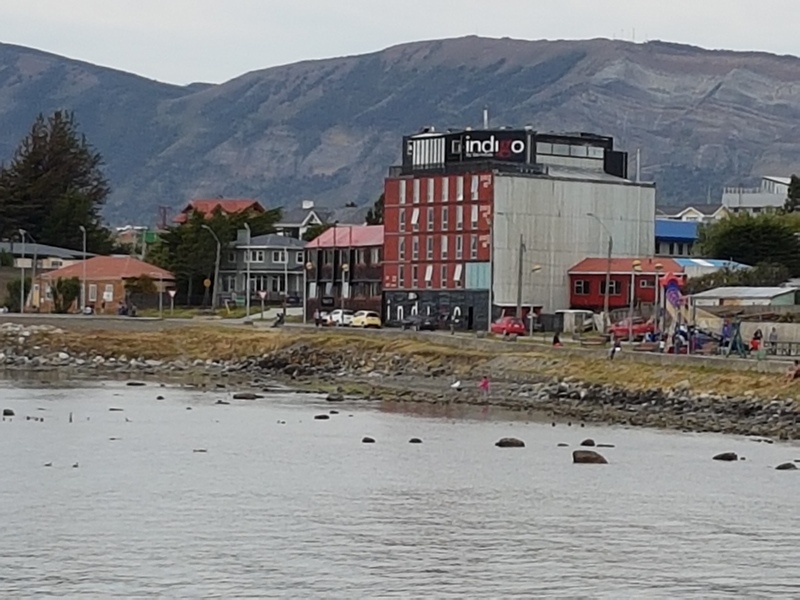 The hotel was called the Rio Serrano, named after the river adjacent to it. 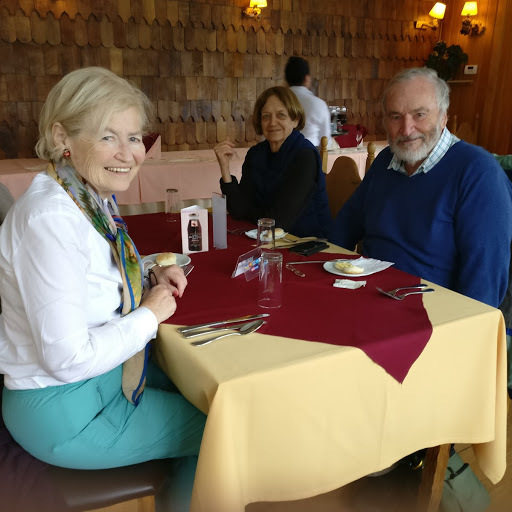 It was modern and extremely comfortable and we greatly enjoyed our stay there. 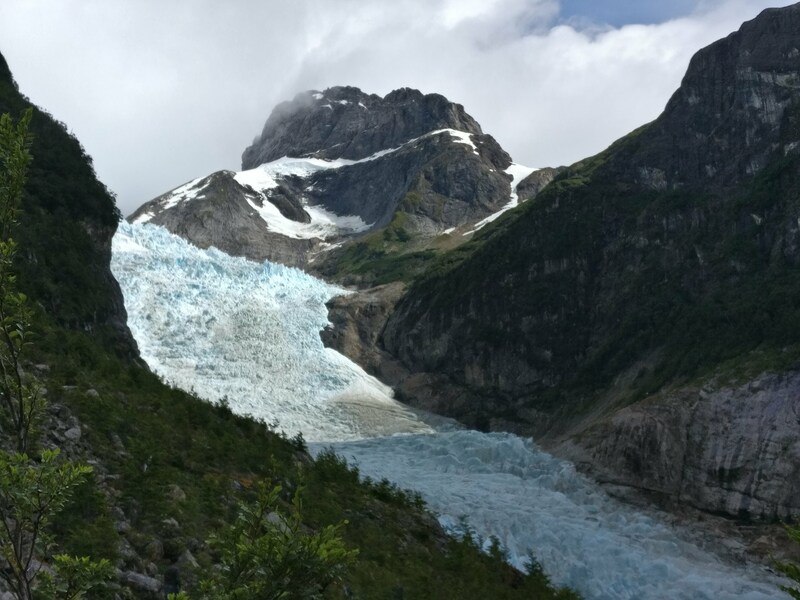 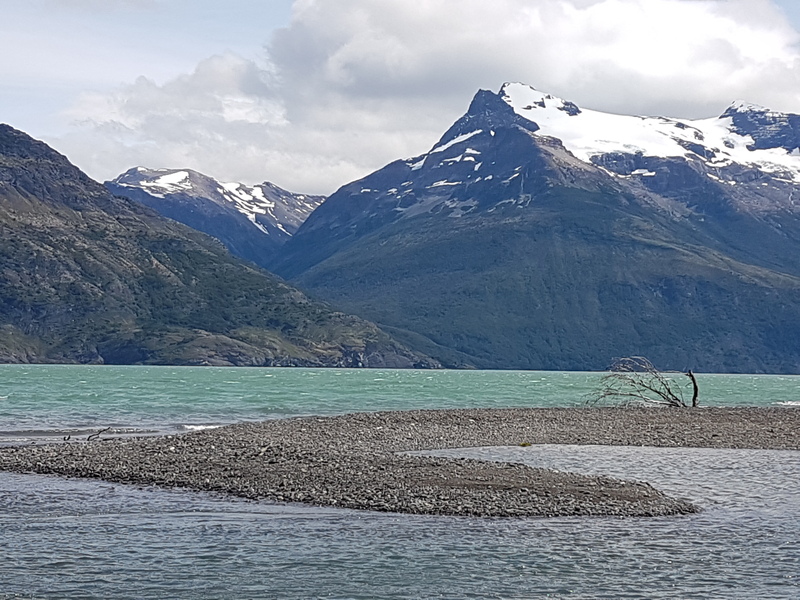 The river was slightly flooded at the time owing to the breakaway of a large fragment of glacier further up river but the views were stunning. 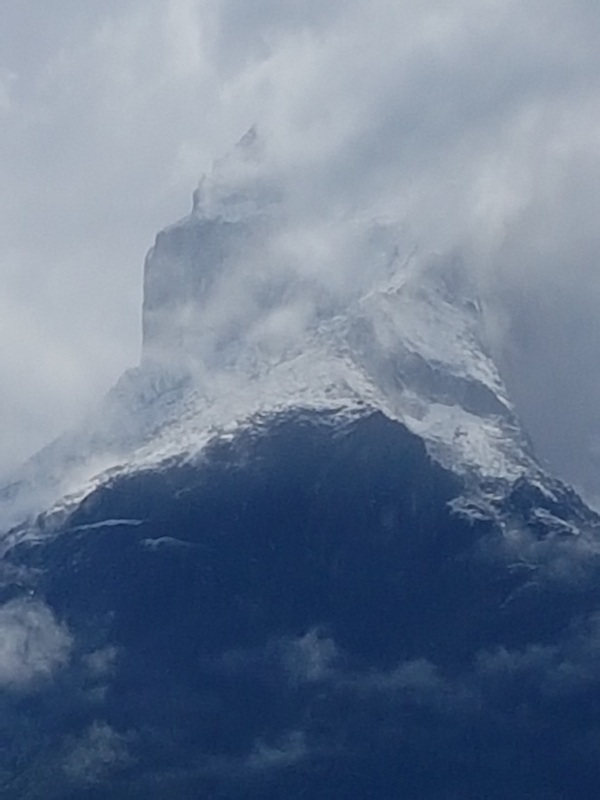 The picture immediately below, for example, was taken from our bedroom window. 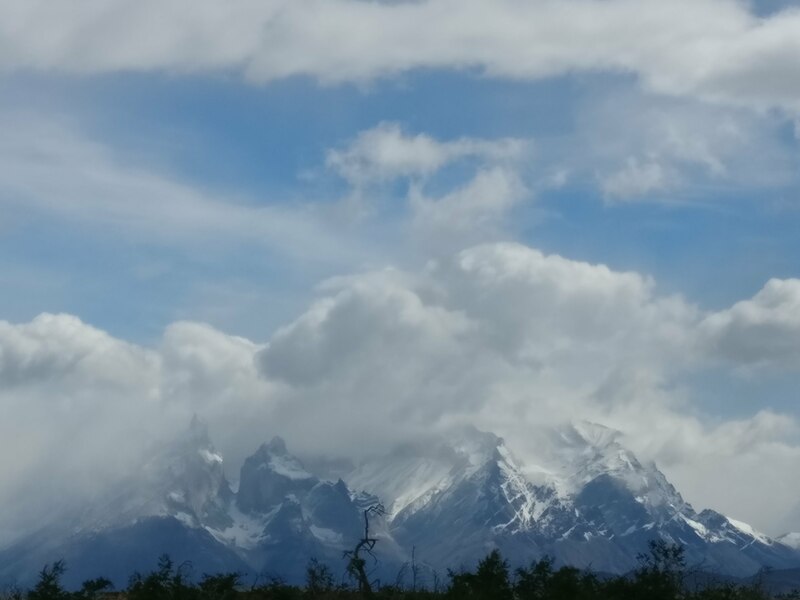 We would stare at the mountains for ever such a long time. 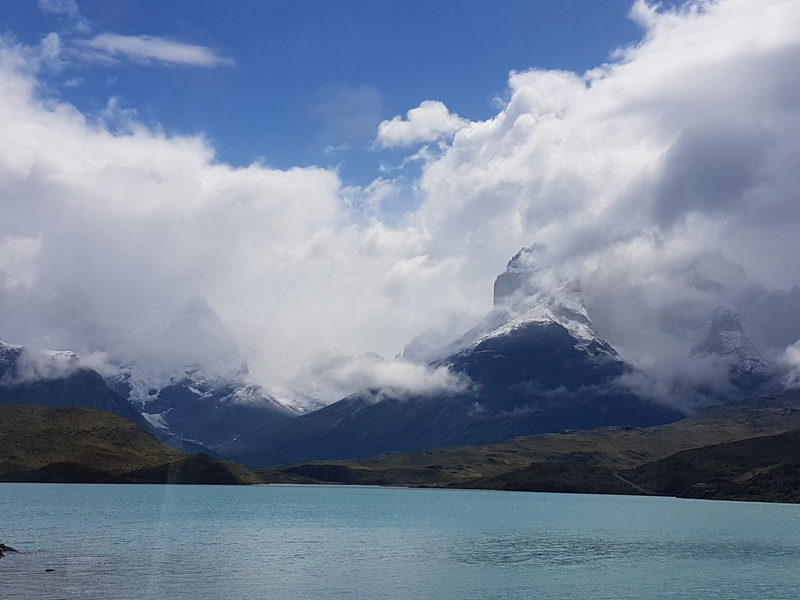 As the clouds scudded across the sky and rose up as they approached the mountain the mountain would be bathed in never ending patches of light and shade. 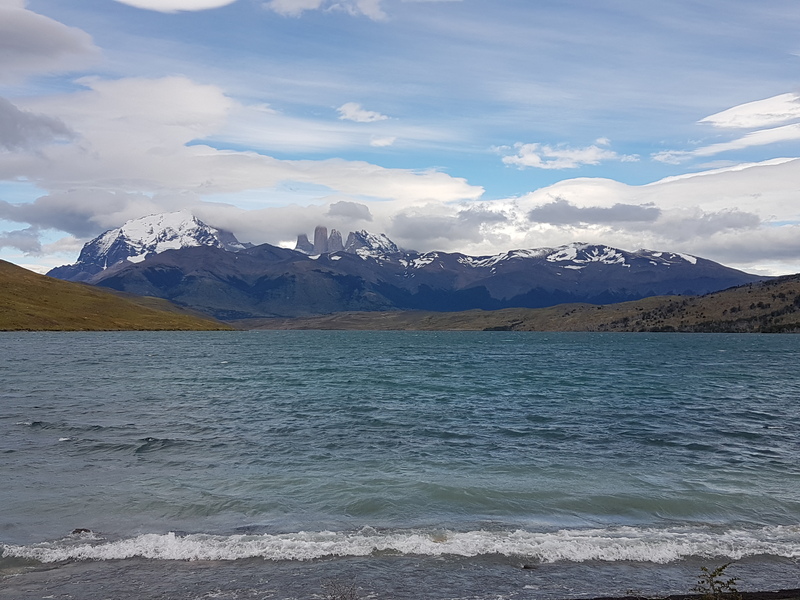 Lago Grey 23rd January 2018. 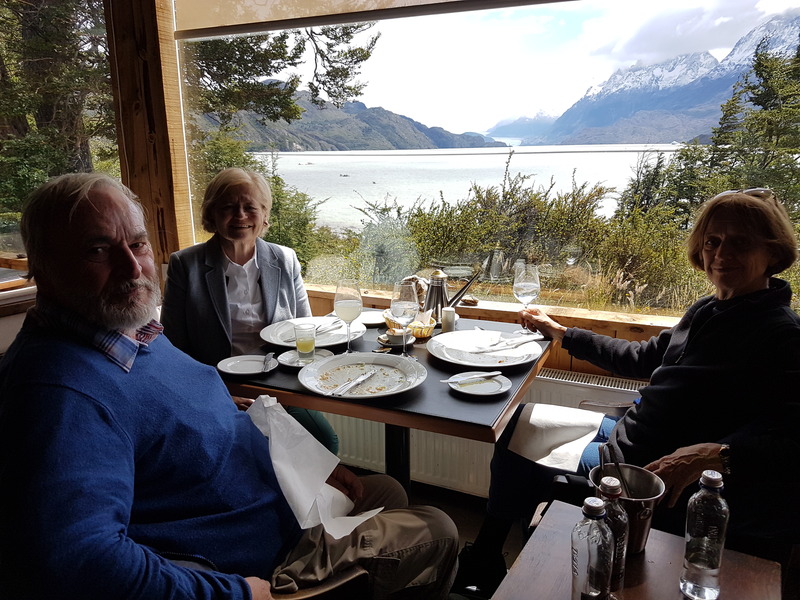 From our base at the Rio Serrano hotel we organised transport to the Hotel on Lago Grey and had a lovely lunch there. 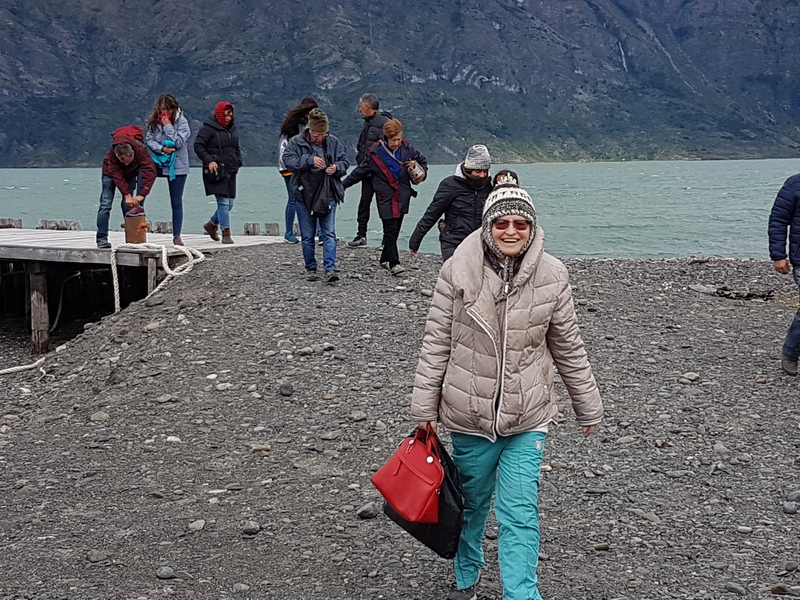 Walking down those calories we had a brief walk along the foreshore before boarding a boat to take us out to a bigger boat so that we could journey across the lake to visit the Lago Grey Glacier. 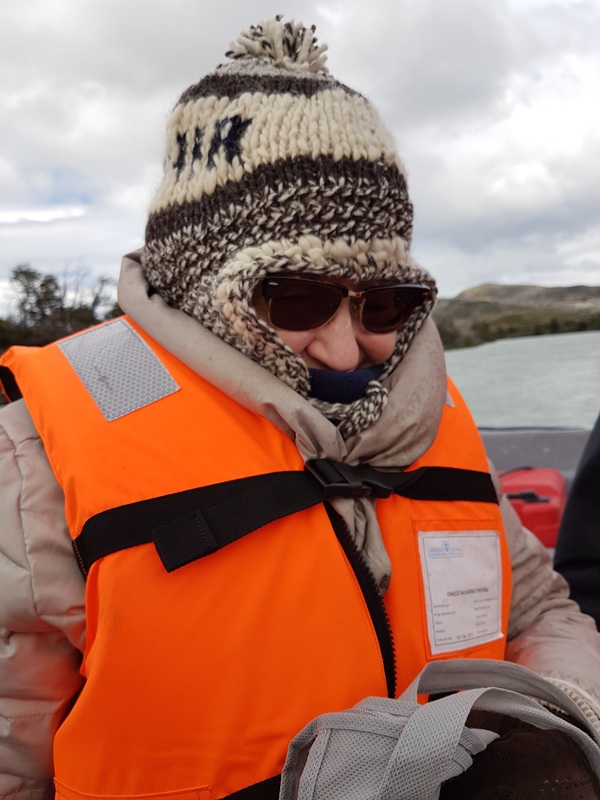 Wearing life jackets was the order of the day. 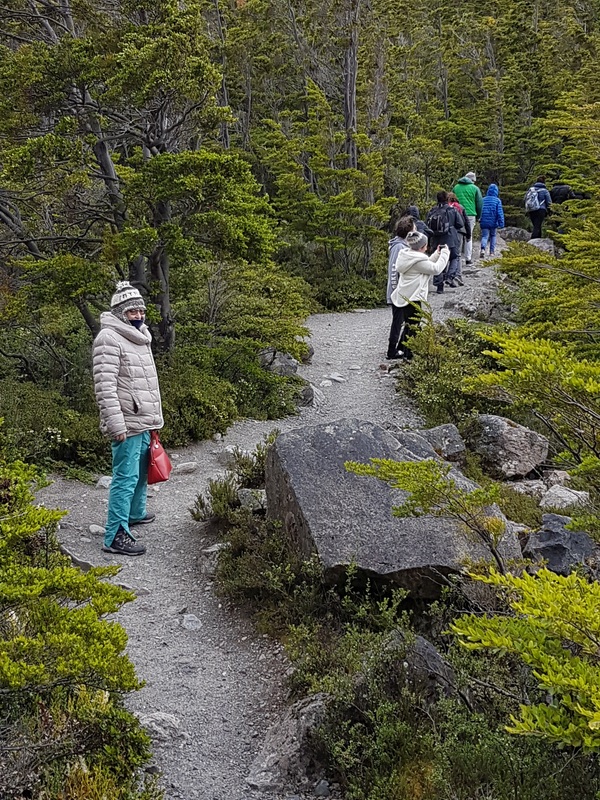 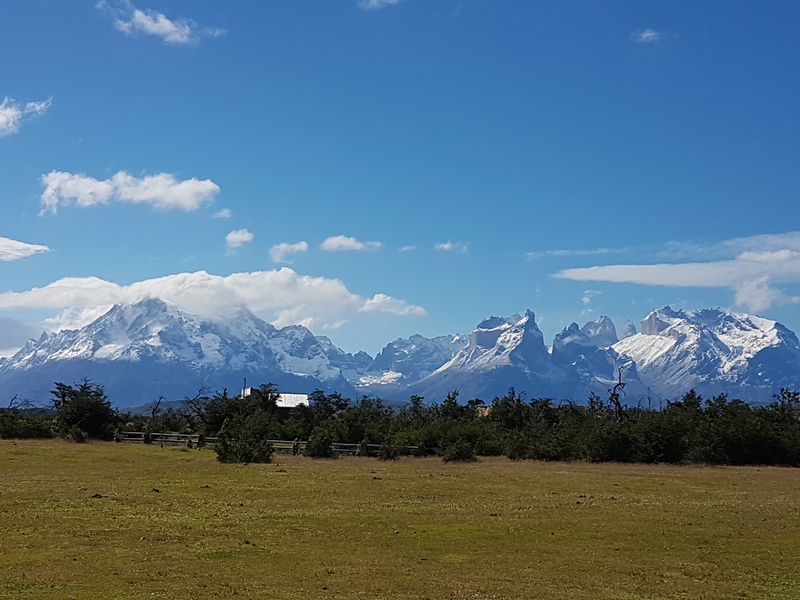 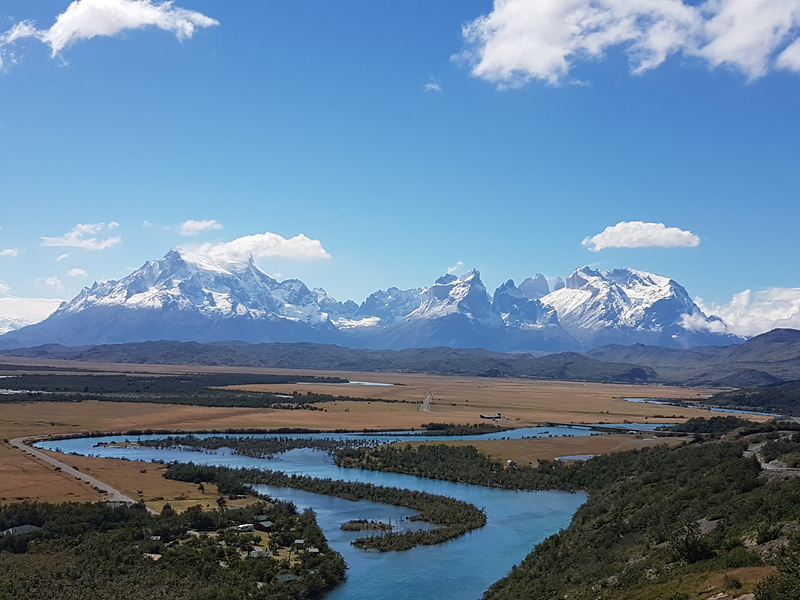 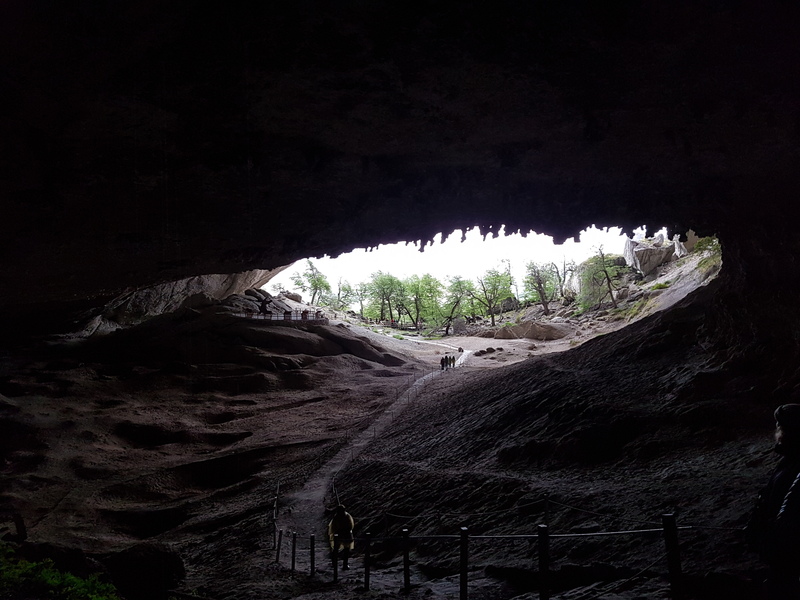 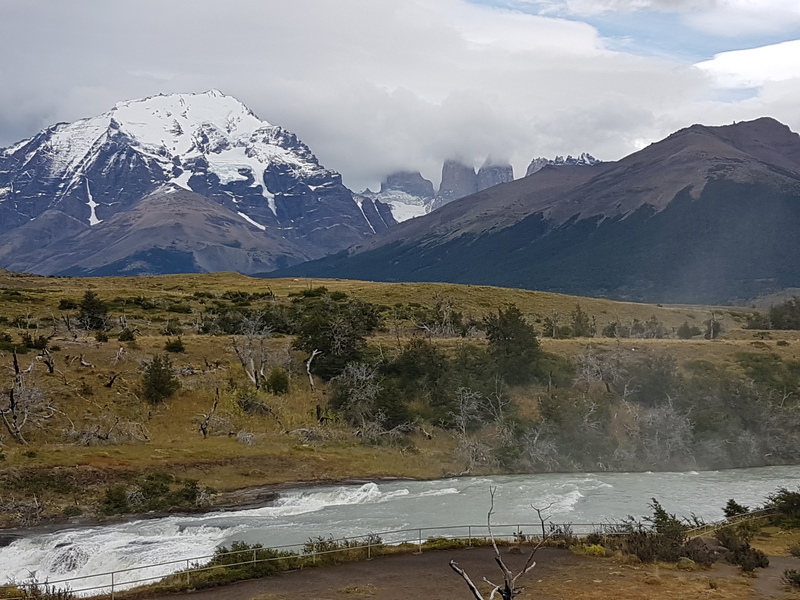 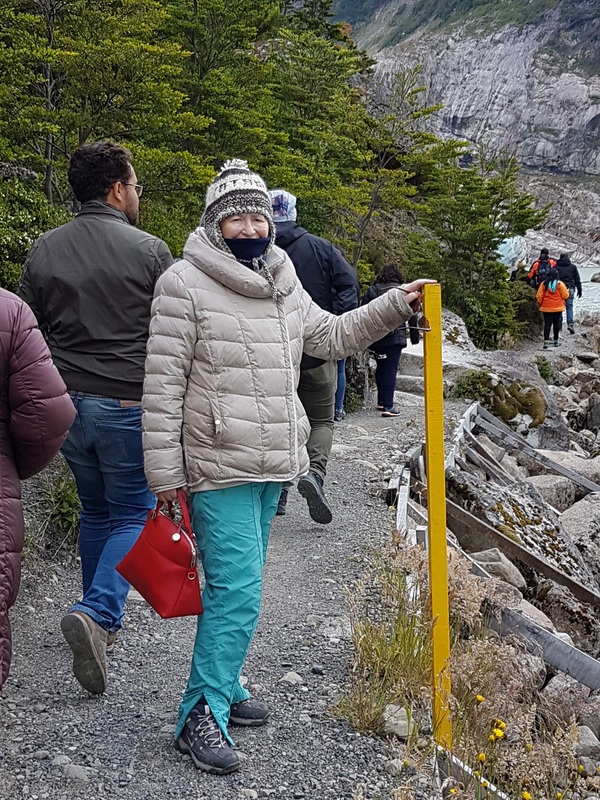 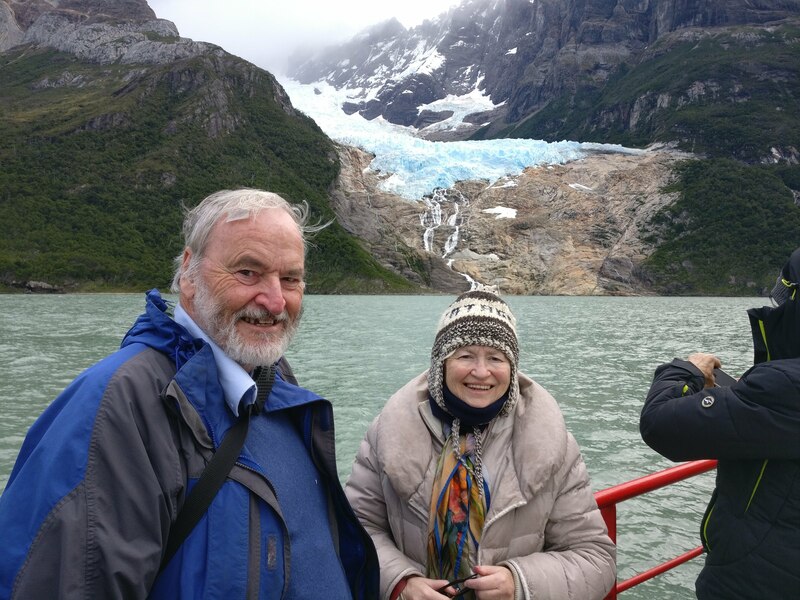 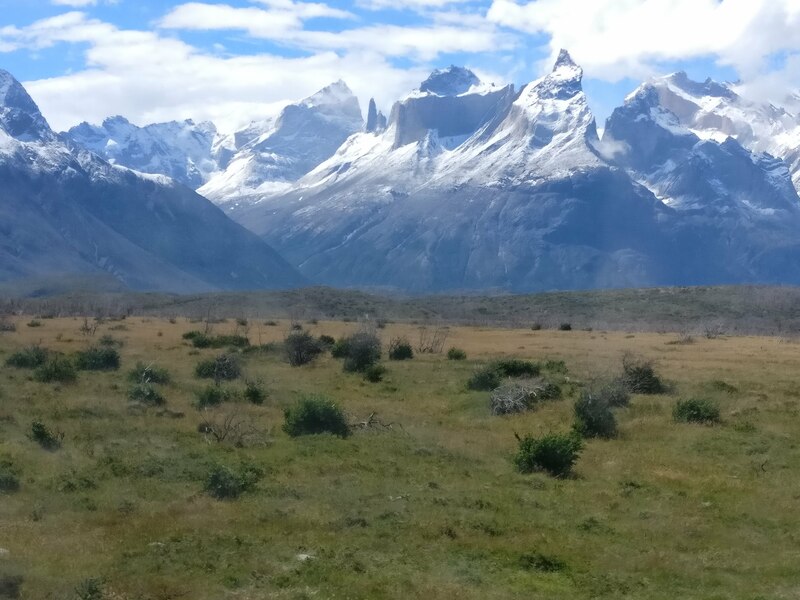 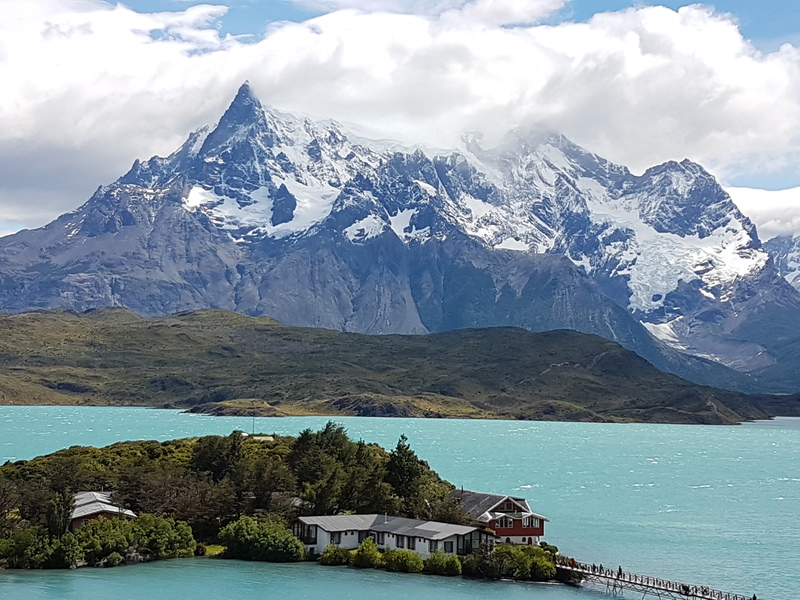 A private tour to the Torres del Paine. 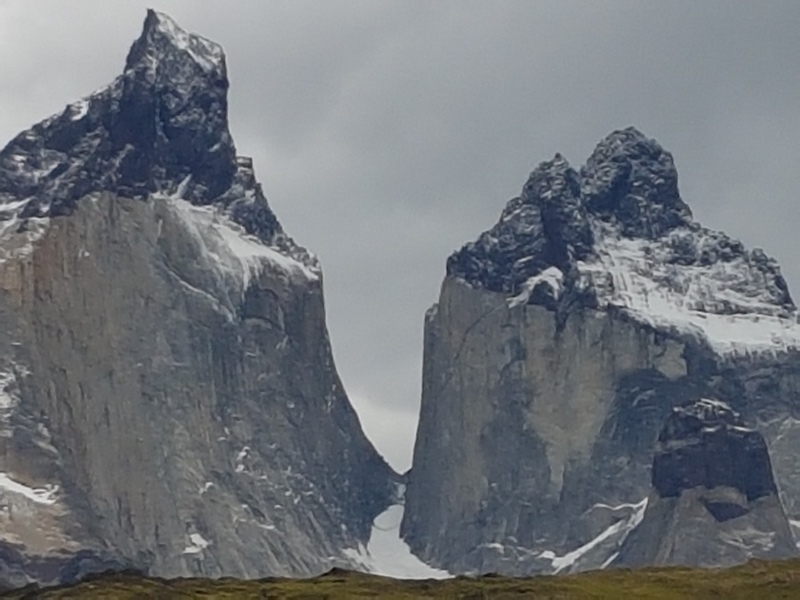 24th January 2018. 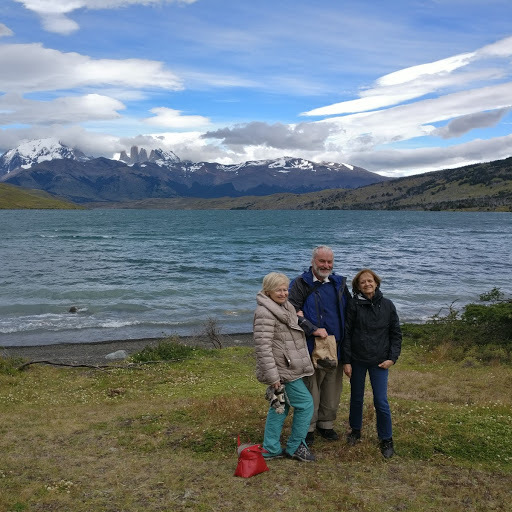 The three of us organised a guide to take around parts of the park we hadn't seen. 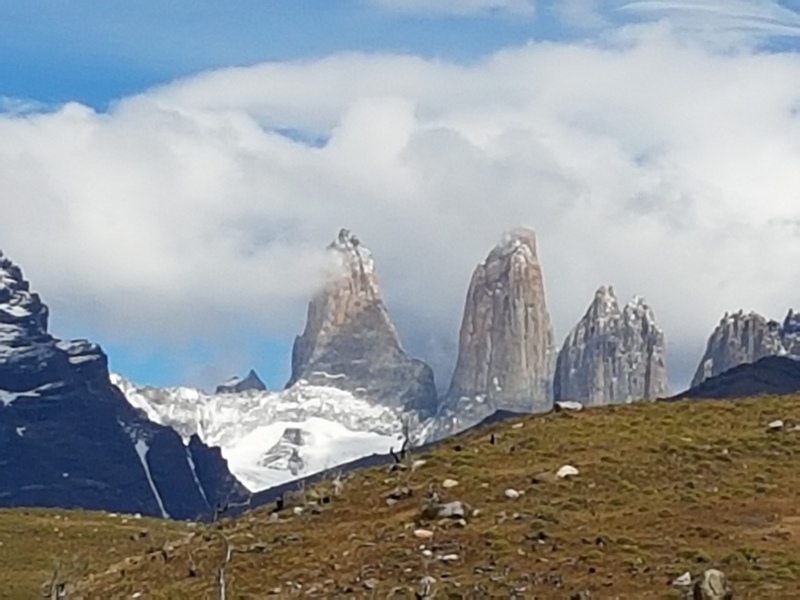 Passing the Horns of Paine (opposite) we first stopped at the Cascadas del Paine (below) to admire the raging waters and to view our first sight of the 3 towers. 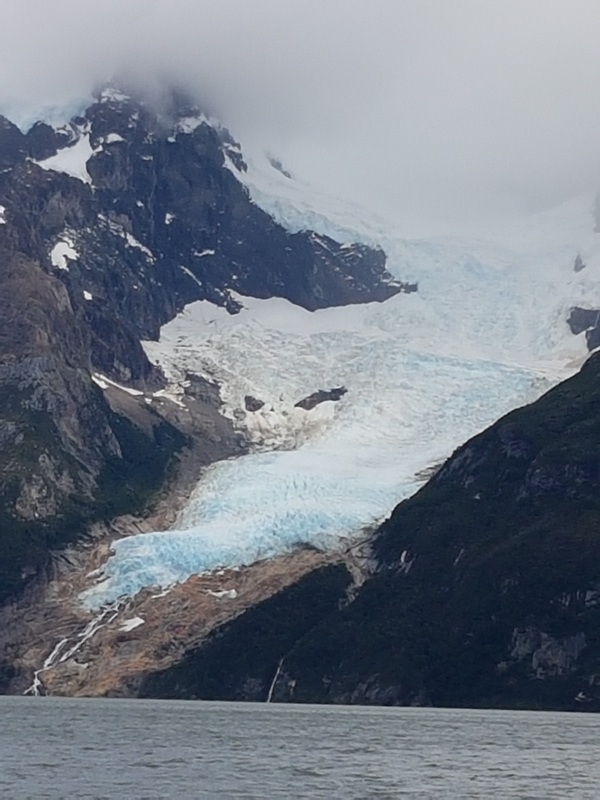 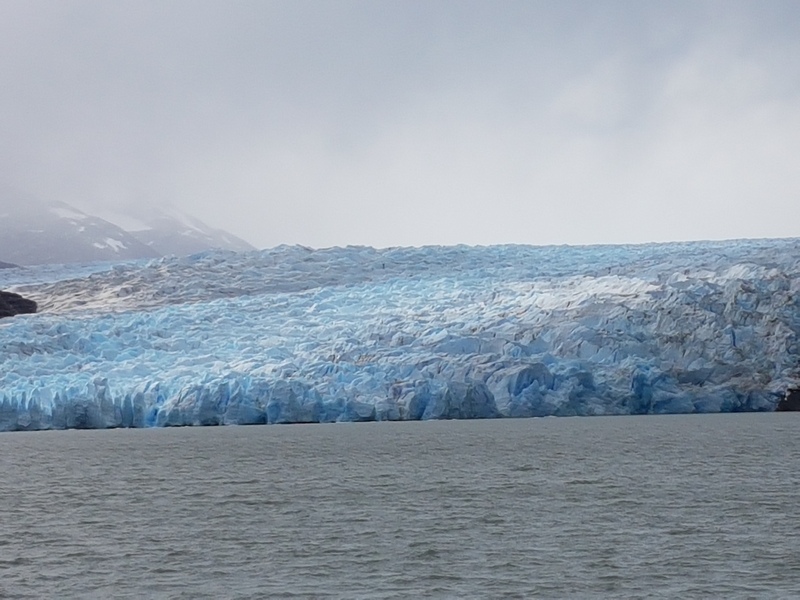 As we got near to the Glacier Balmaceda we could see how the ice had been retreating from the Fjord. 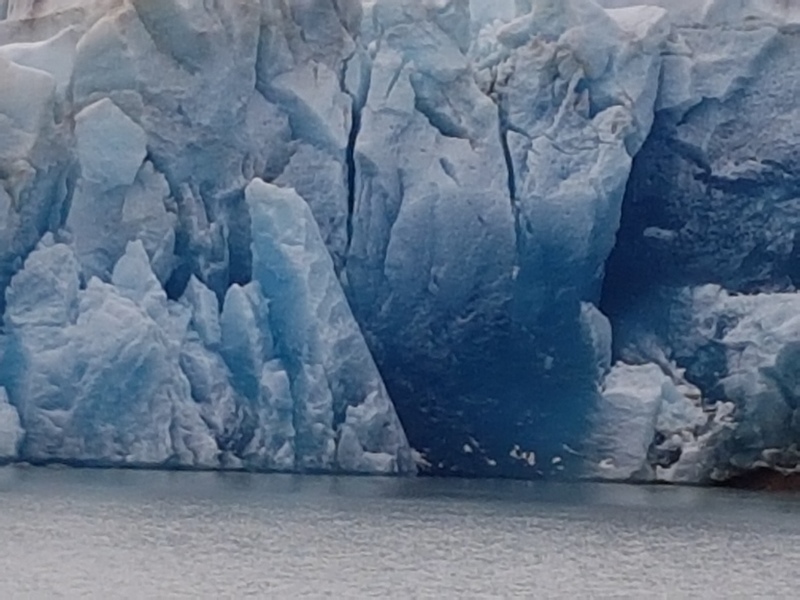 The guide said that it has reached down to the water only a couple of years ago and had thinned considerably. 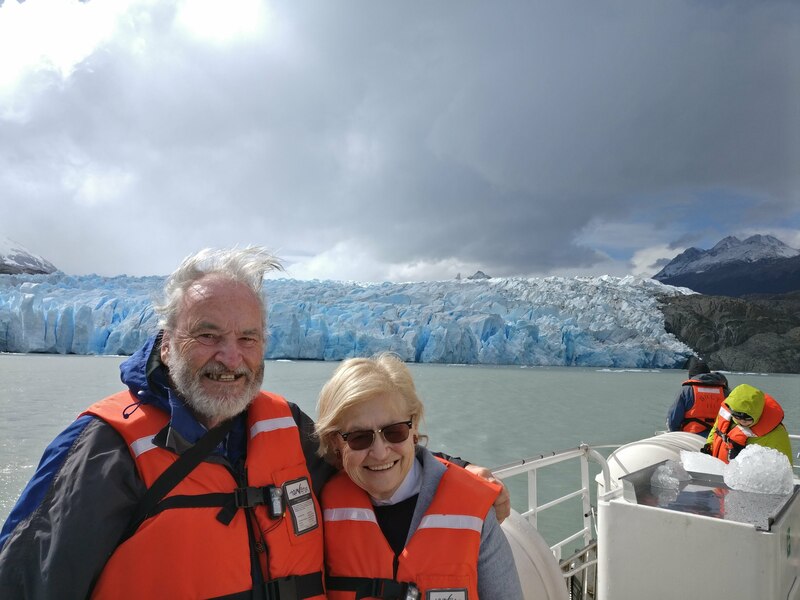 We then approached the Glacier Serrano. 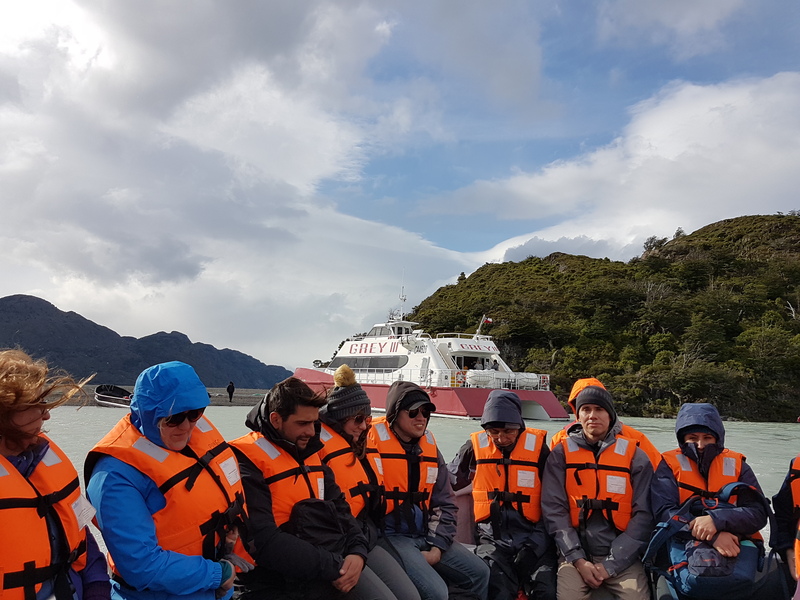 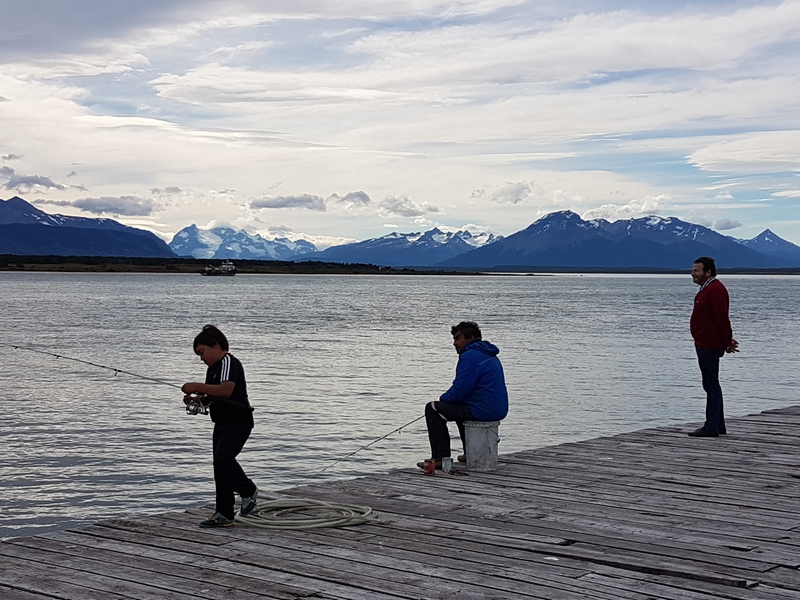 The boat docked at a little pier and we had to walk for half an hour up a small path up to the end of the glacier..
Our final stop before going back to Puerto Natales was at an estancia where a large meal was prepared for all of us. 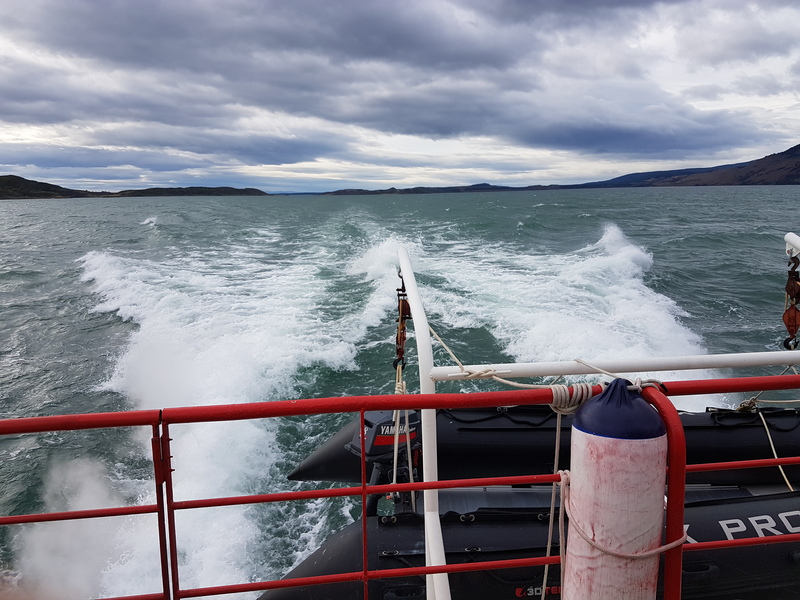 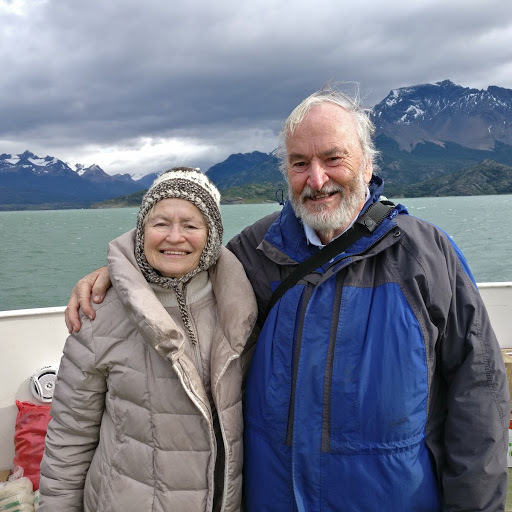 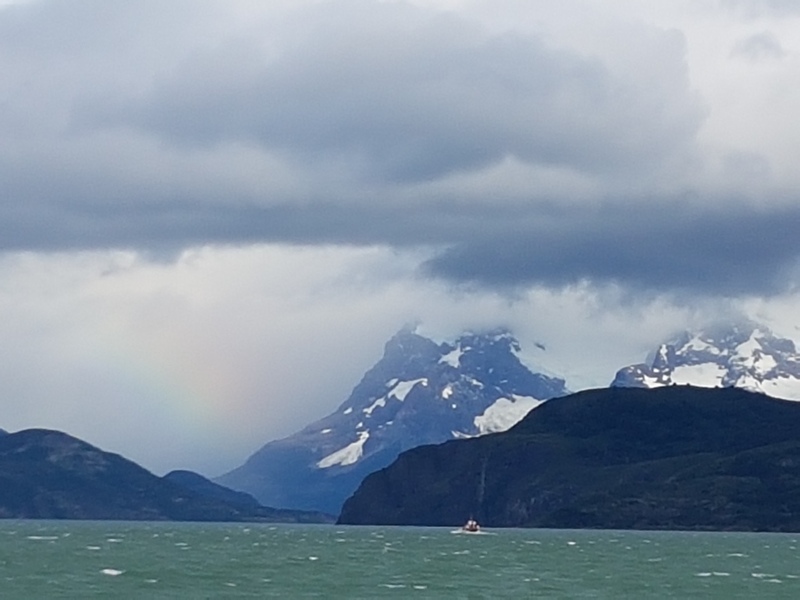 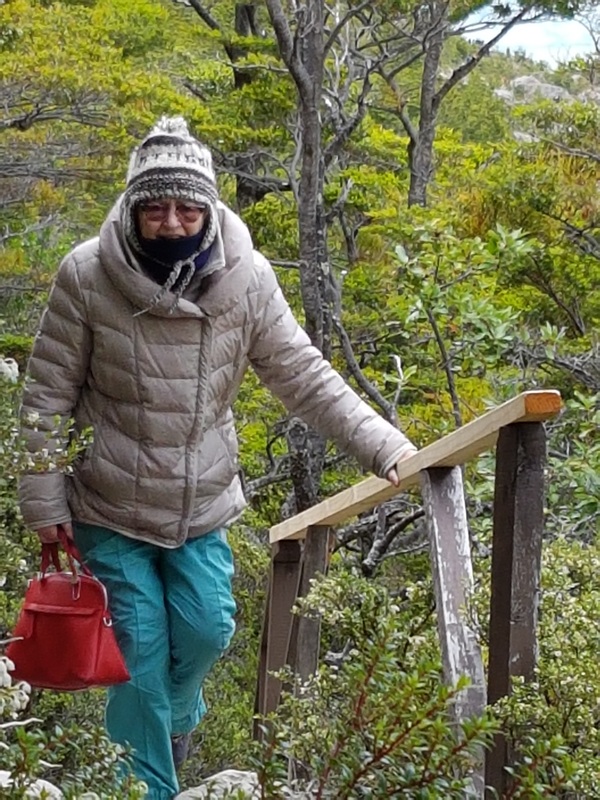 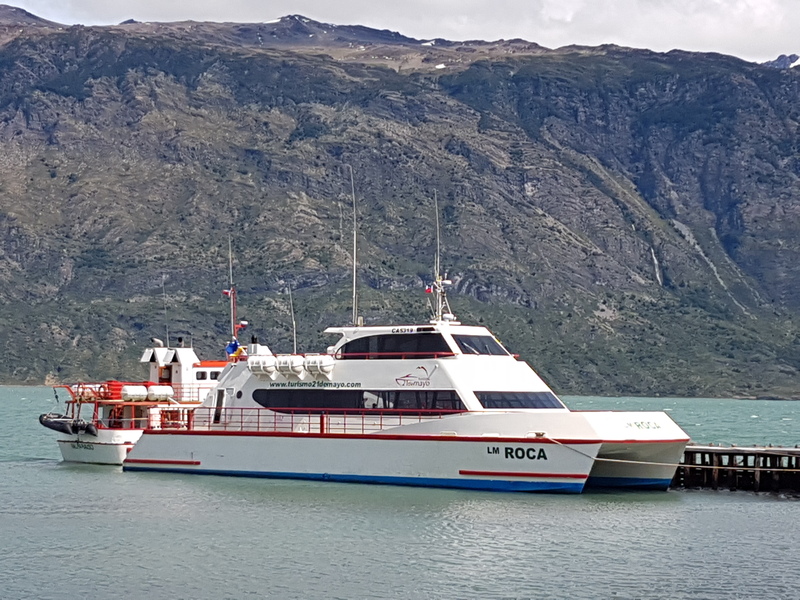 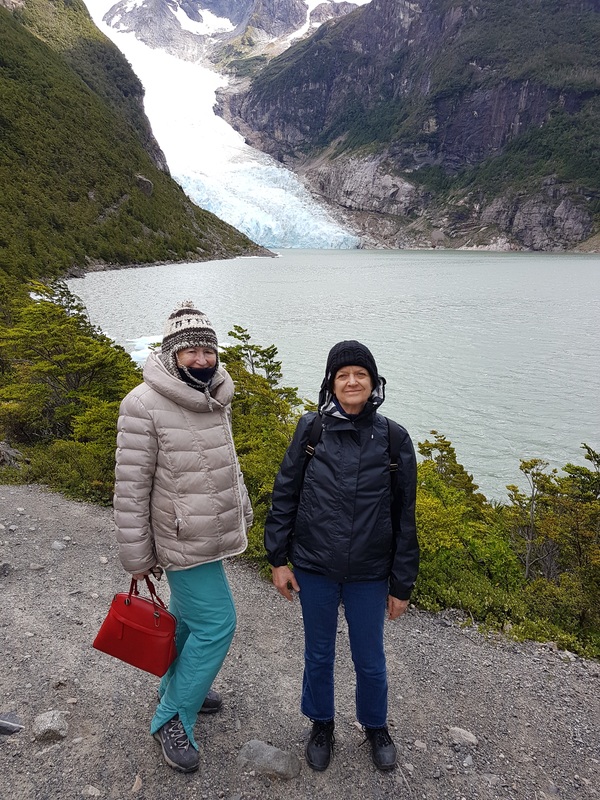 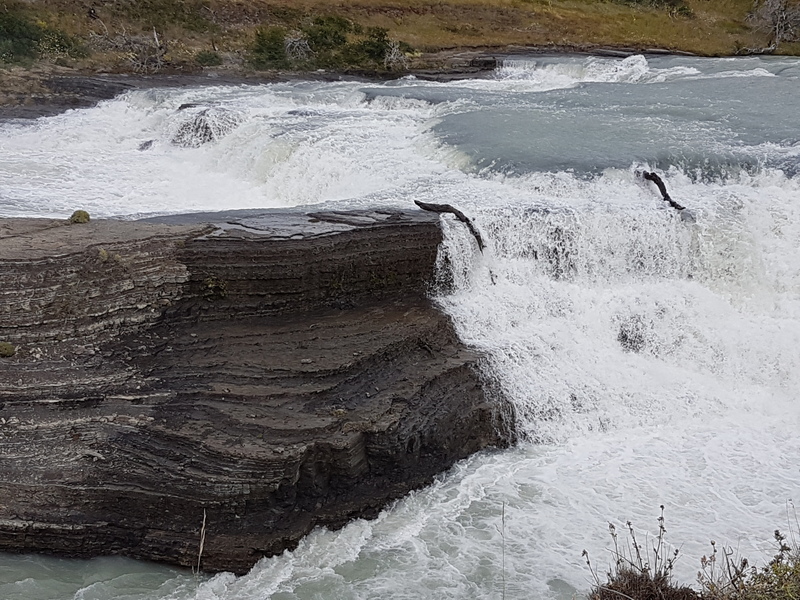 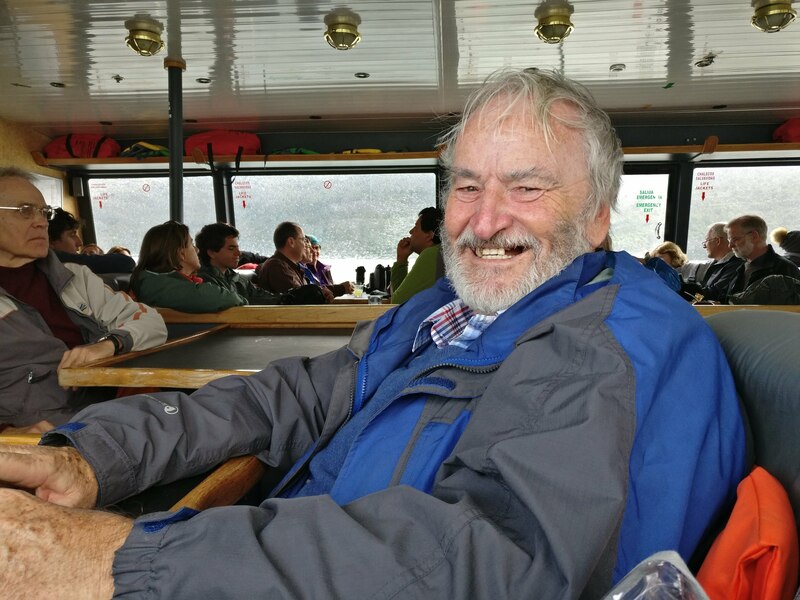 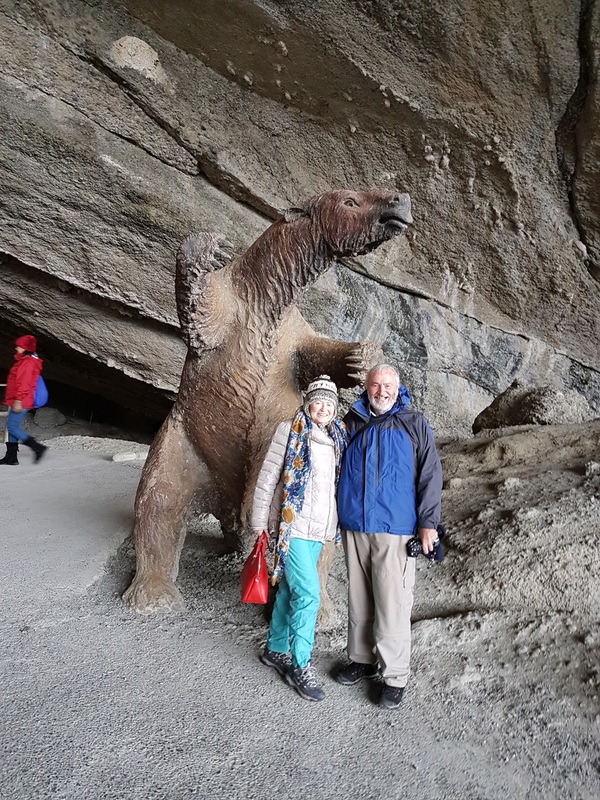 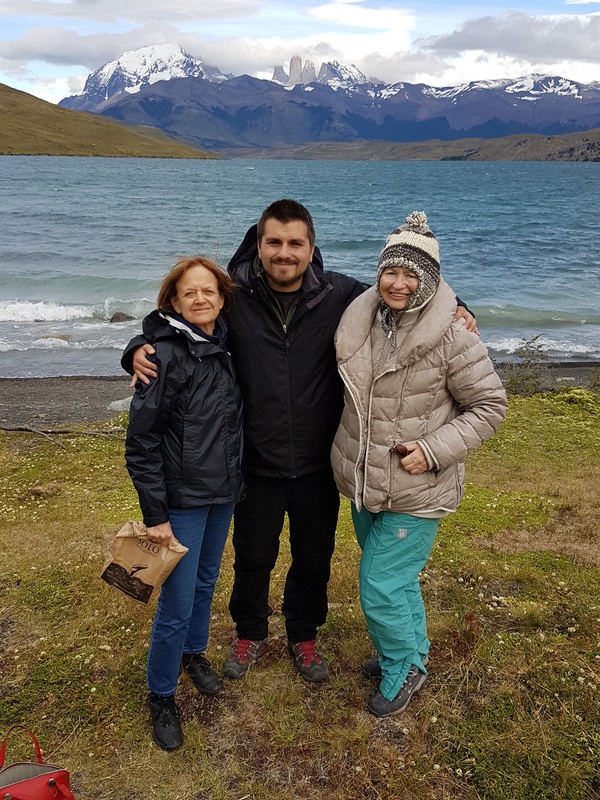 Then it was back to Puerto Natales at the end of the day and dinner with a couple of colleagues of Stephany's who were travelling in the area and then another bus ride the next day back to Punta Arenas and a flight back to Santiago on the 26th of January.